My husband was at work and I was thinking about driving myself to the hospital. I decided not to as my labor escalated quickly. When my in-laws got to the house, we immediately left. I was sure I was in active labor at this point. My father-in-law, Big Jeff, drove quickly towards the next big town. Suddenly my body started pushing. 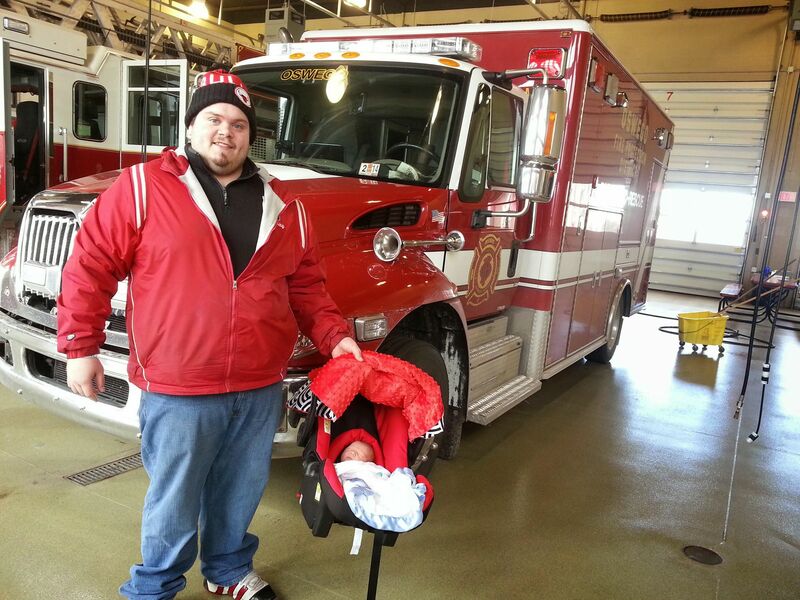 After the 2nd push, I told Big Jeff that we needed to call 911 because my son's head was already out. We hadn't made it too far down the road. We pulled over on the side as there were no parking lots around. The ambulance was there quickly. The paramedics were super sweet and worked very quickly. As soon as they got me on the stretcher, my water broke. The paramedics started pushing the stretcher to the ambulance and my body pushed one last time. My son, Braylan, was here. The paramedics were well trained and very calm. They actually had me laughing in no time. 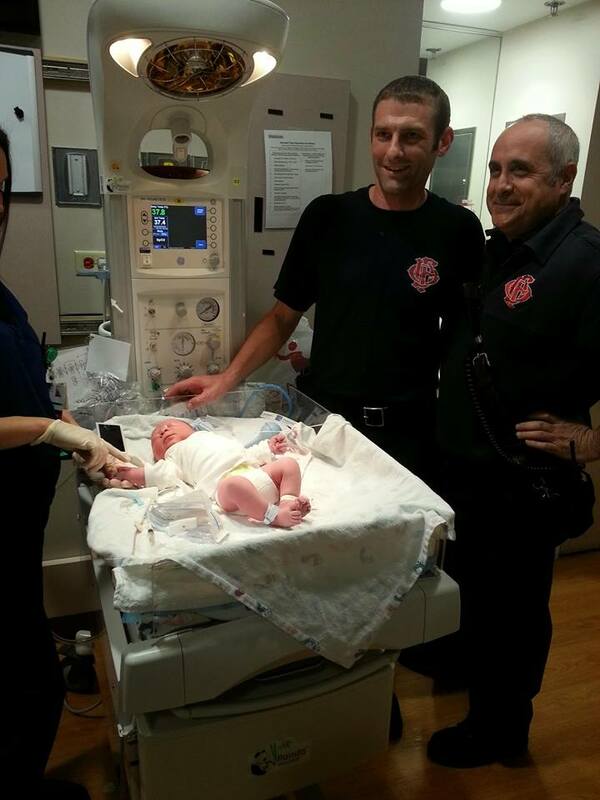 The paramedics were such an important part of Braylan's birth, that we brought Braylan back to the station a few days later to see the paramedics who delivered him. 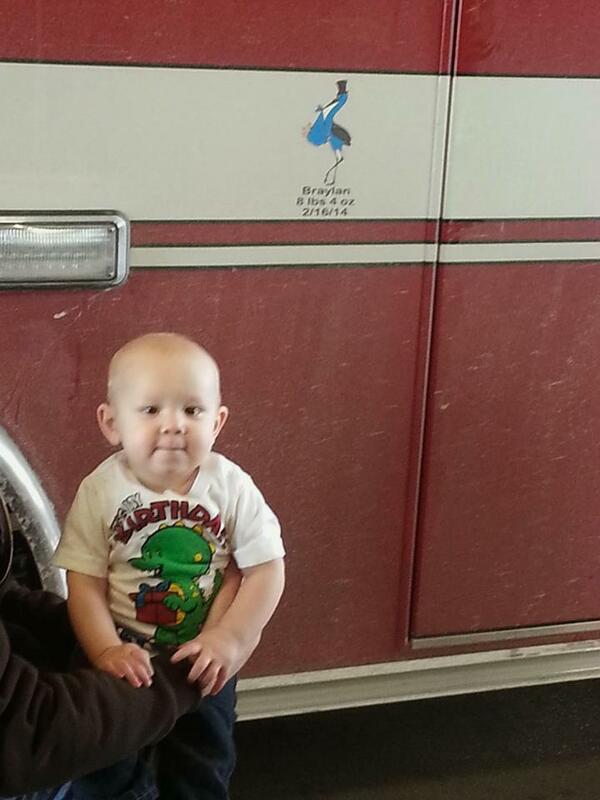 The station put a blue stork on the side of the ambulance to commemorate Braylan's birth. 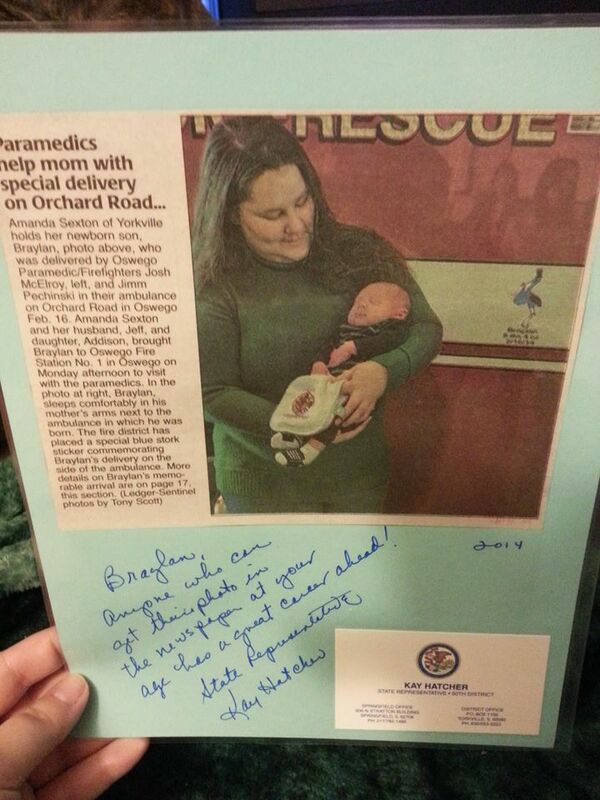 Newspaper clipping of Mom, Amanda, holding her newborn son next to the ambulance where he was delivered. A blue stork decal is on the side of the ambulance commemorates Braylan's birthWe are so thankful to these paramedics for all they did. I couldn't have done this without those paramedics from Oswego Fire Station. We still celebrate Braylan's birthday by having him visit the same fire station.